The bottom seal of your garage doors should be changed on a regular basis, especially before an expected change of climate. 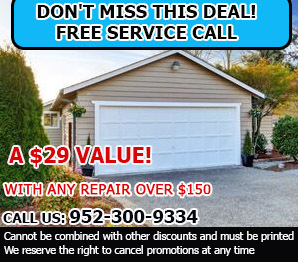 Adept at replacing any type of door part, our technicians offer quality services for garage door repairs in Minnesota. So should you find yourself in a fix, you know which company will bail you out of the problem. We offer a convenient garage door maintenance or tune-up service that ensures the smooth operation and long useful life of your door. This garage door opener company with an ever growing clientele delivers commendable results by proficient technicians. Use our emergency services for resolving any garage door issue from broken spring to malfunctioning opener.